Photo: Piotr Beczala as Alfredo and Ailyn Pérez as Violetta, taken from Royal Opera House’s Flickr photo set for 2011-2012 production. Went for Royal Opera House Covent Garden’s 18-year-old production of Verdi’s La Traviata on the 2nd day of the new year. Some excellent singing were in offer, in particular from Ermonela Jaho’s Violetta, whom I thought had well-balanced clarity and coloratura (unlike the very popular but awkwardly out-of-sync Anna Netrebko here) and a very warm-spirited Paolo Gavanelli as Father Germont. The period staging was amazingly decorated, accompanied with tender lighting. What else to expect but a typically melodramatic ending to the show for the ill-fated, self-sacrificial Violetta. Sempre libera! Here’s my favourite version. Angela Gheorghiu at the Royal Opera House in the same production of 1995. Love the great singing packed with Italianesque panache, acting not so great though, haha! 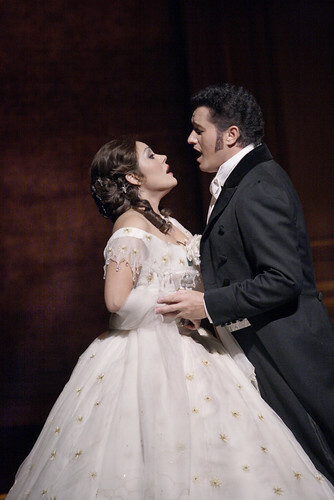 Libiamo (Drinking Song), Rolando Villazon and Anna Netrebko at Salzburg Festival 2005. An interesting contemporary production with a very awesome Rolando Villazon.